If you thought North Norfolk was just a summer holiday destination, think again. 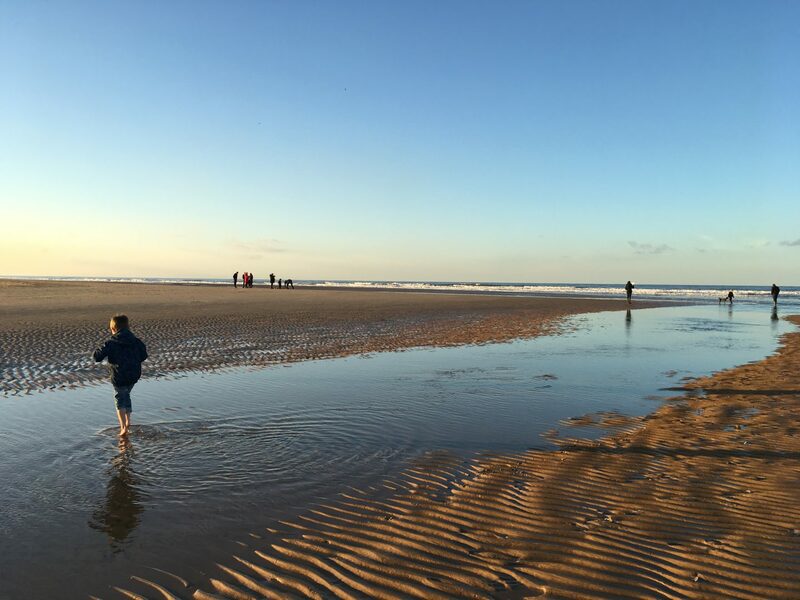 We enjoyed a short break in North Norfolk at the end of October, exploring two of the region’s loveliest country estates. 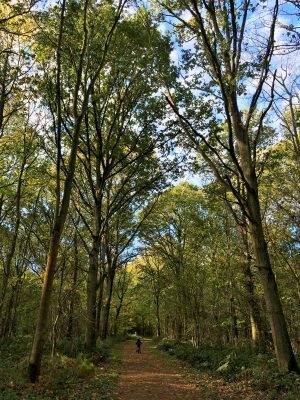 With the crowds of summer gone, we felt like we had the place to ourselves: stunning walks along the beach and peaceful bike rides through colourful woodland. We spent our three nights at Cannister Hall Barns near Fakenham. 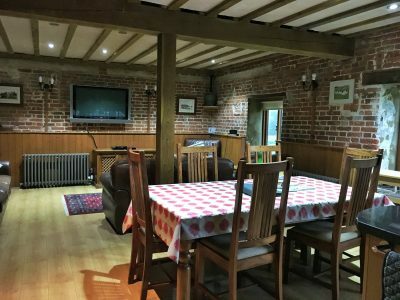 I picked the property, via the excellent Kett Country Cottages, as it has an indoor swimming pool and a well equipped games room. The swimming pool water was a tad chilly but the kids loved the games: pool, table tennis and table football were immensely popular. 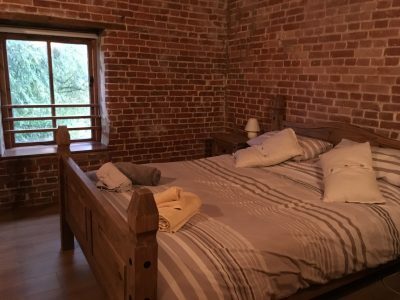 We stayed in the three bedroom Hayloft which had everything we needed for our stay. I’ll write a separate post on the property in due course. 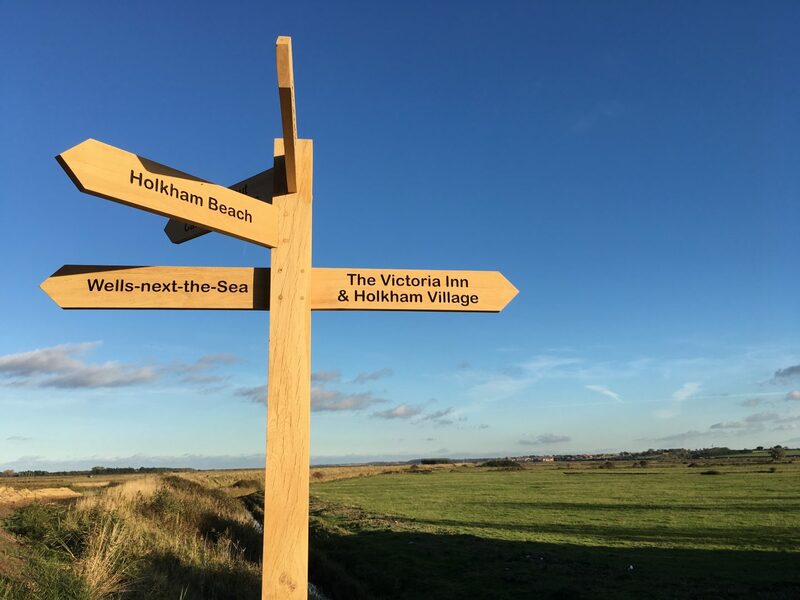 Cannister Hall Barns are in a great location for exploring North Norfolk, with Wells-next-the-Sea, Holkham, Hunstanton and Blakeney all within easy driving distance. 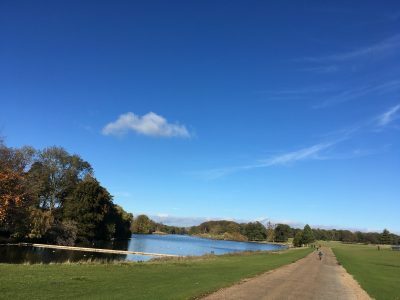 On the first day of our short break in North Norfolk we drove the 20 minutes to Holkham Hall for a walk and cycle around the grounds of this vast estate. 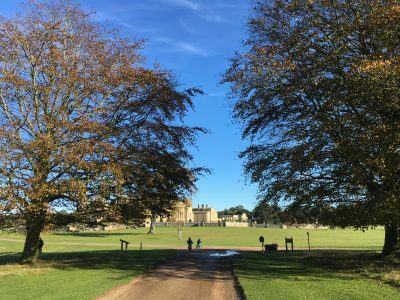 Located just west of Wells-next-the-Sea, Holkham Hall and the surrounding land has been the family home of the Earl of Leicester since the 18th century. 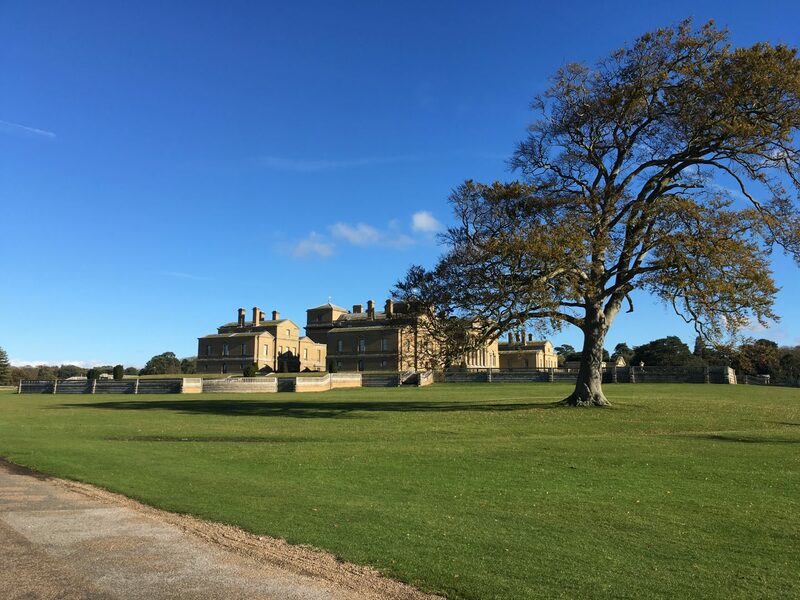 The estate comprises the Palladian Hall and its grounds, along with extensive farmland plus the Holkham National Nature Reserve which runs along the coast from Wells to Burnham Overy. In high season it’s possible to hire bikes, explore the stately home and learn about farming in the excellent Field to Fork exhibition. As we were visiting at the end of October these attractions were closed, however as our younger son has a very low tolerance for indoor attractions this wasn’t a problem. 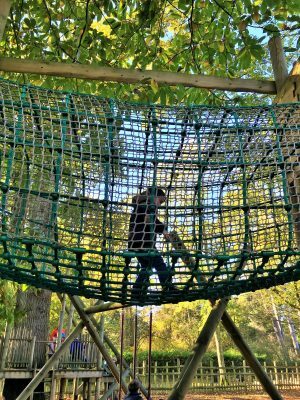 There’s a brilliant adventure playground at Holkham (shut over winter but open for the half terms) which our kids could happily have spent the whole day in. We eventually peeled them off the zip wire and convinced them to hop on their bikes (which we’d brought from home) and explore the grounds. There are wide paved and gravel roads through much of the estate which are perfect for little kids like ours to explore with relative independence. The UK is packed with grand estates, historical country piles and manicured parklands. 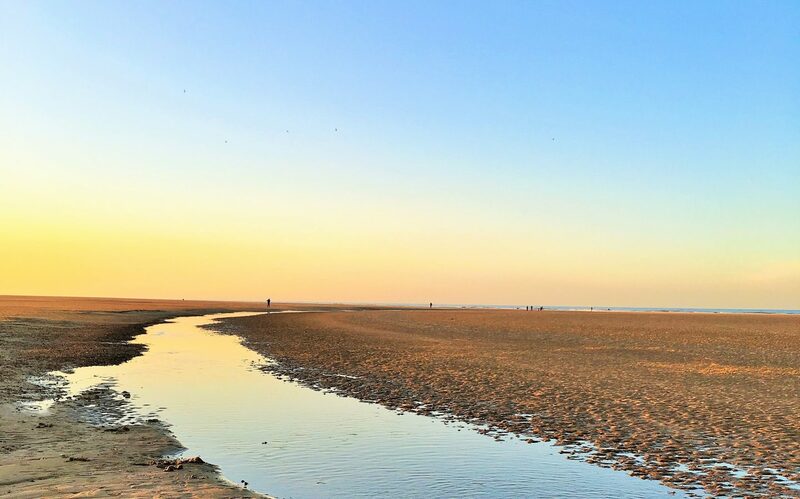 What sets Holkham apart is its incredible stretch of coastline. We’d visited this part of Norfolk several times but on this occasion, despite it being autumn, the weather was at its most perfect. It was cold but completely still with not a gust of wind in the air. Once we’d exhausted the parkland we drove over to the car park at Lady Ann’s Drive for our trip to the beach. From the car park, it’s a short walk through the pine woods to the immense sandy beach. 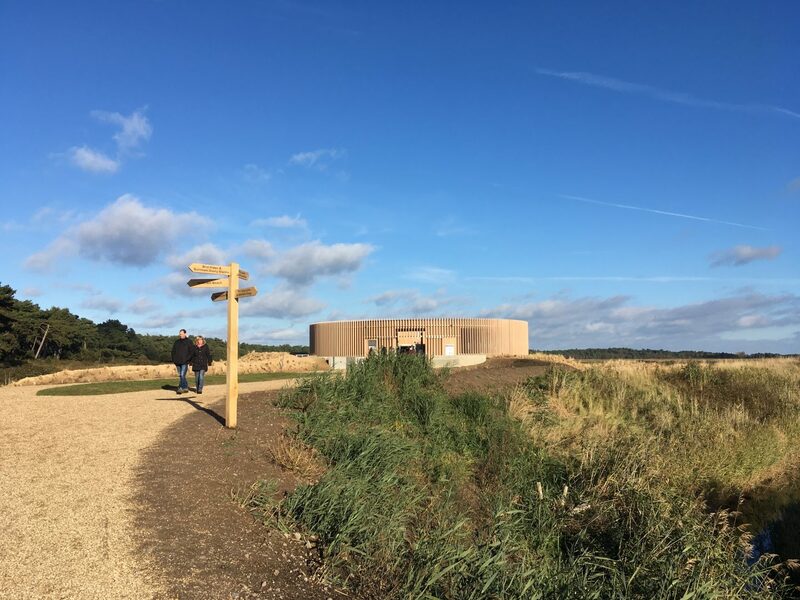 There’s a new visitor centre, the Lookout (with impressive green credentials) next to the car park where you can learn more about the reserve. Most importantly though, the Lookout has toilets (and a cafe) so the beautiful sand dunes and pine forests can return to their job of protecting nature rather than protecting the modesty of those looking for a discreet place to have a quick wee. We arrived just before dusk, the tide was out and the sun was setting behind the sand dunes. We played on the beach and hunted for shells. My older son went for a paddle (a bit chilly apparently) and we watched incredible clouds of migrating starlings swirl through the sky. Next time I’ll take a more sophisticated camera along to capture the birds. My younger son has been on a bike of some sort since he was 18 months old. Once he reached that toddler age where he wanted to escape the confines of his buggy but only on his terms (ie be carried up a hill when the novelty of walking wears off), I decided to plonk him on a balance bike. As a result, he can now do a six mile bike ride at the age of 4. Unfortunately his road safety skills are not at quite the same level so I’m always on the look out for safe places for him to cycle which aren’t too hilly (his legs are too short for a geared bike). 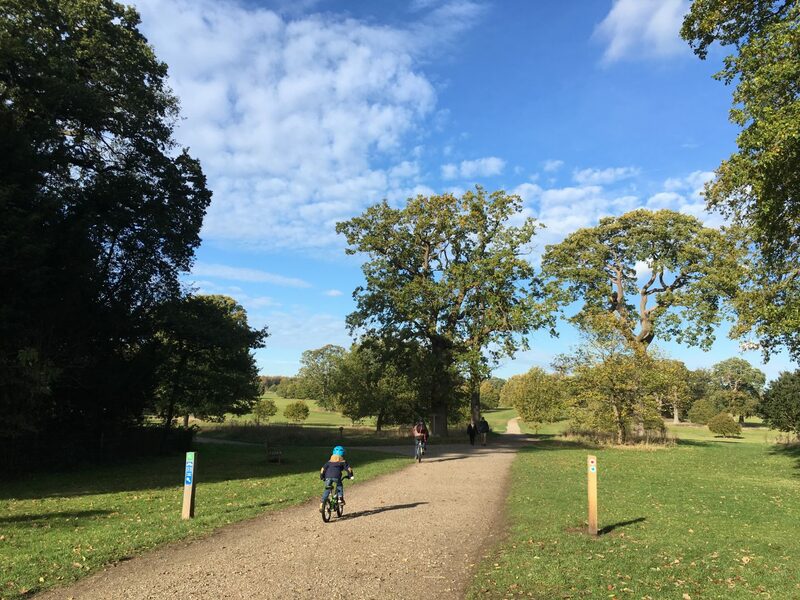 Blickling Estate, along with two other National Trust properties, has entered a partnership with British Cycling and HSBC to offer visitors affordable bike hire, (we paid just £4 for 3 hours for an adult bike). And they aren’t just any old bikes, we hired Frogs for us grown ups at Blickling which was a real treat (our bikes at home are a tad heavier!) Blickling also offers trailers, tag alongs and balance bikes so there’s something for all the family. If you’re considering investing in a Frog bike (once my boys are a bit bigger I expect we will), this is a great way to give them a try. 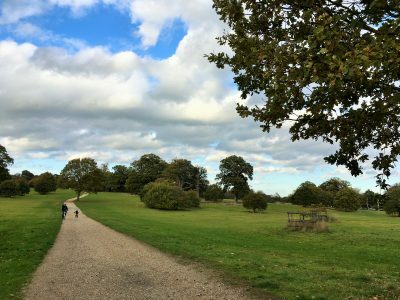 We’ll be paying a visit to Osterley Park just west of London for our next National Trust bike ride. Subject to popularity, the bike hire will be available year-round so it’s a good activity for keeping the kids warm on a winter’s day out. Just call ahead to check opening hours. 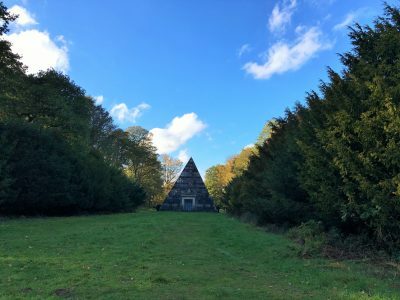 With our lovely lightweight bicycles and a packed lunch we set off on Blickling’s four mile loop which passes farmland, unusual buildings and a few exhilarating slopes for the kids to zoom down. Now that our kids are confident on their bikes, us parents can actually cycle properly with the boys rather than stopping to give them a push every few metres. It feels like we’ve entered a whole new era of parenthood and it’s very liberating. 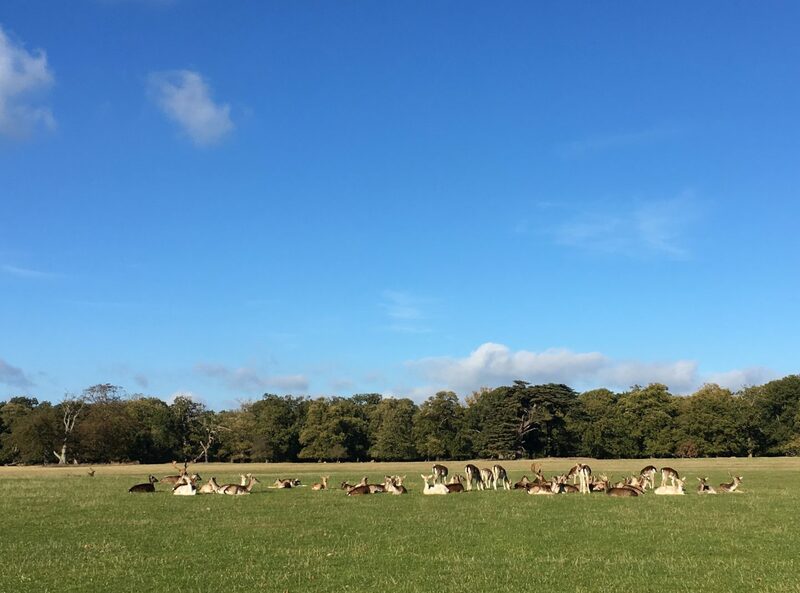 Holkham Estate has limited opening times over winter. Please check the website for full details. Looking for more UK family holiday ideas? Wow so impressed with your four-year old! Which balance bike did you use? Mine never got on with them as think it was too heavy…Your photos look idyllic, I love this part of the world, would love to get back here – autumn looks like a lovely time of year to visit. We’ve been through a few balance bikes. I’m not sure what make they were but they weren’t expensive. They were quite simple ones and fairly lightweight, I guess that it key. Avoiding stabilisers would be my biggest suggestion, they are completely pointless. To teach my boys to pedal (they learnt on the same day when they were 5 and 3), we pushed them down a long gentle grassy slope. The slight incline gave the momentum so that they could concentrate on balancing rather than needing to do lots of pedalling. I always thought we would need to teach them in a big flat empty car park but a grass slope is perfect in my opinion (provided it’s nice and dry)! It’s great isn’t it? It’s our favourite beach destination as it’s the easiest to reach without tackling busy motorways. We had an icy wind once at the end of May, October was much nicer! I fear that phase shall be upon us very shortly! I love those family rites of passage – when you realise all the potential you and your littles can tackle after crossing through. Yay to the freedom of family bike rides, especially when such a beautiful place to do so! 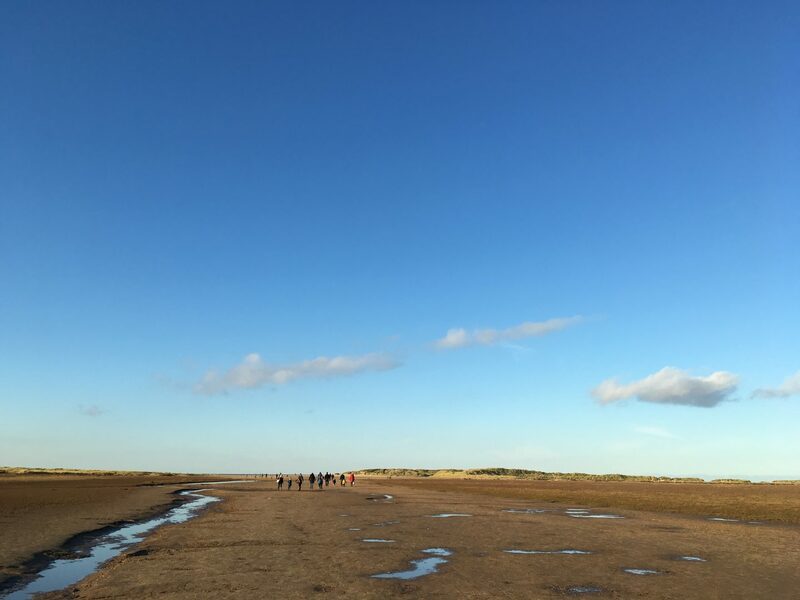 I’m a sucker for a walk along the beach – any time of year, so would definitely target the Holkham grounds and National Park – love the seaside pics there! Thanks for sharing with #FarawayFiles – cheers from Copenhagen. Erin, how easy is it to hire bikes for very small children in Copenhagen? My 4 year old is on the small side and I’m wondering whether to bring his bike with us when we visit in April. He’s rather attached to it..! Yes, big skies and the sea are magical aren’t they? We could have stayed there for hours but it was getting rather dark! I am lucky enough to have a cottage in Brancaster, so I am totally sold on North Norfolk, such a special part of the country. It is, I can’t wait to return for a summer trip! It’s a great part of the country. We live relatively close so it’s our fav location for a quick beach break! I love your photos of the sand dunes and beaches with wide open skies. 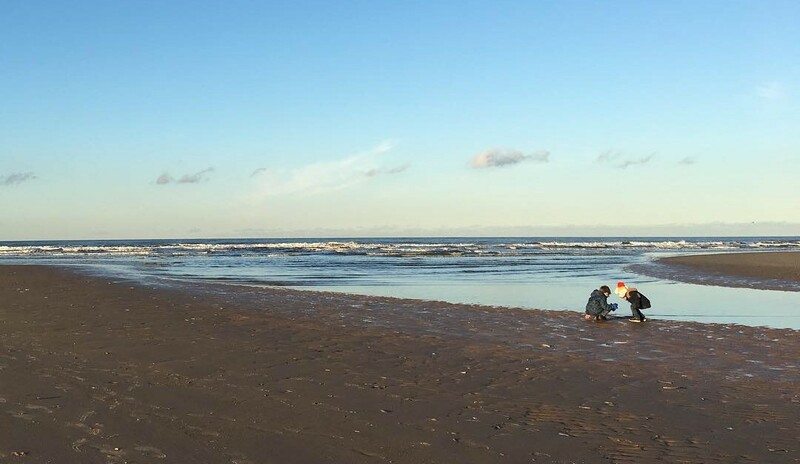 North Norfolk looks like a fab place to visit with kids. 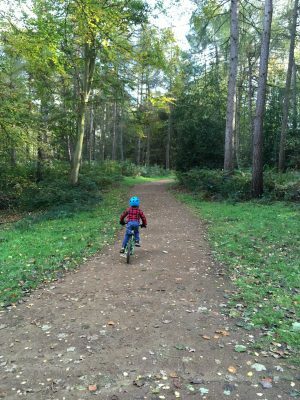 My youngest also just started to ride his own bike, and I can’t wait to go on family cycles with them in safe places like Blickling. Cycling is such a fun family experience. We’re heading to Denmark at Easter so I’m hoping we’ll be in our element there! Autumn and winter are lovely times to visit. The beach is so beautiful when it’s empty! Yes, the playground is fab. And we had it pretty much to ourselves! We were so lucky with the weather! Yes, the bike hire is brilliant, I really hope they roll it out at other locations. It saves us strapping our bikes to the car! I do like Norfolk. It’s so unline anywhere else in the UK. It seems to me more like parts of the Netherlands – unsurprising, given its closeness. And yes, I’m reassured that I’m unlikely to run into anyone having a sneaky wee :-). I’m looking forward to seeing a bit of the Netherlands when we catch the ferry there this summer. My experience is limited to Amsterdam and Utrecht so I’ve enjoyed reading about some of your visits. 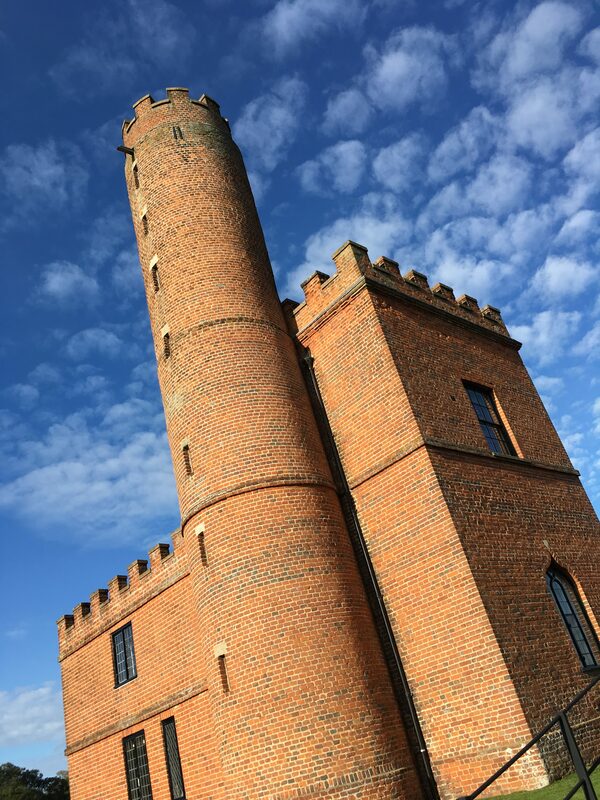 Norfolk is definitely on my radar this year – and it’s good to know out-of-season is a good time to visit. 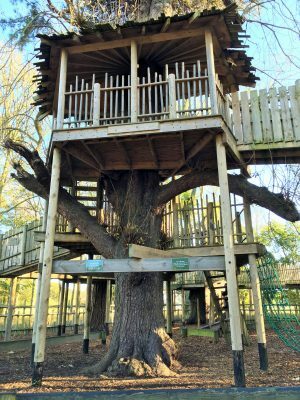 The Holkham playground looks fantastic for little ones. It’s definitely a year-round destination. We were very tempted to go back for Feb half term. What a beautiful location! The beach and that playground are spectacular. I’m going to save this as we are likely going to the UK soon. ha ha, good point! My son went for a paddle and really regretted it! 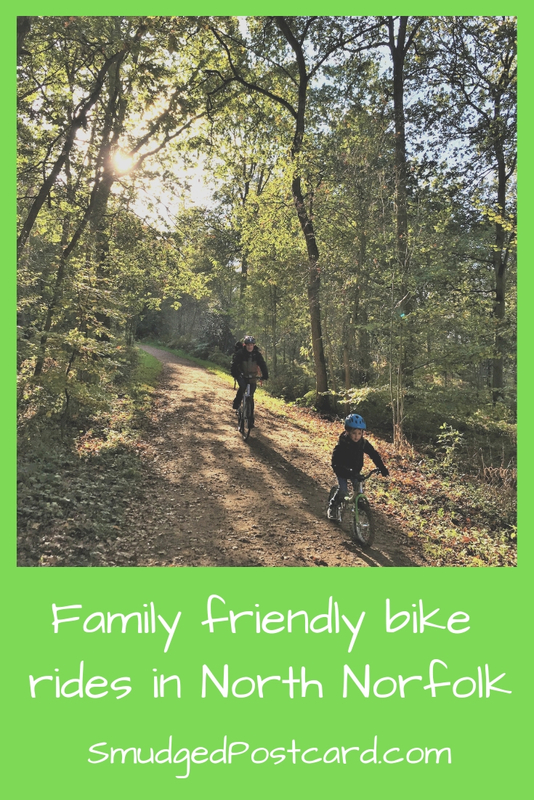 The bike hire is a brilliant idea – I’d have loved to find something like that when my boys were younger. Gorgeous photos of the countryside and coastline – you were lucky it wasn’t windy cos it really is wide open spaces! I really hope bike hire takes off at places like this. It’s a great way to cover a bit more ground with little people! I was just saying recently that I’d love to head to North Norfolk soon as it has been such a long time since I visited (my GCSE field trip to be precise, where we studied coastal erosion!). I absolutely love to look of the beach at Holkham, with the sand dunes and pine forests it looks simply dreamy! 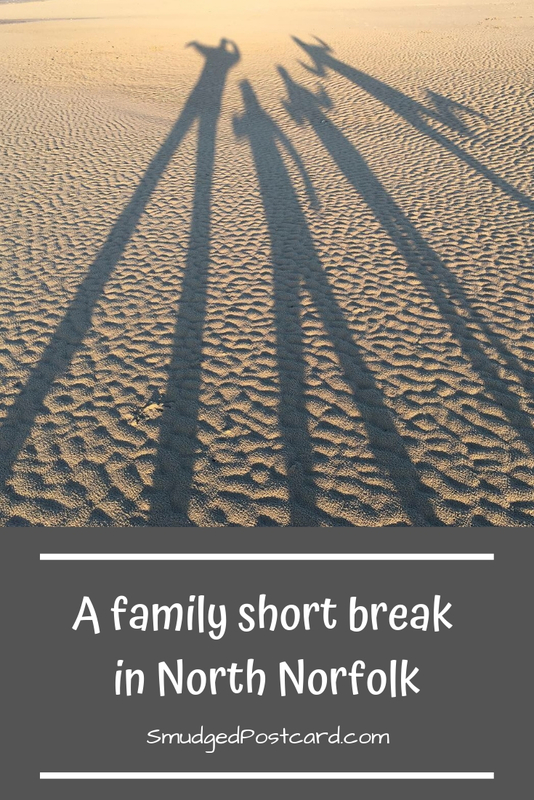 We spent the October half term in North Norfolk (post about our week over on my blog!) and my three boys loved it – they keep asking when we’re going back. Didn’t make it to Holkham Hall though, definitely going on the list for next time, it looks lovely. Will have to head over to your blog to see what you got up to! There’s so much to do there, will be interested to see where you went. 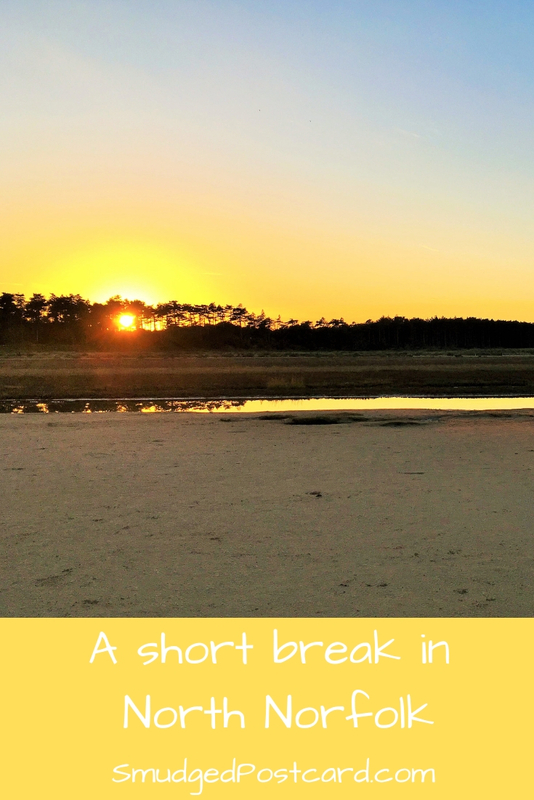 Norfolk is our nearest beach area of choice, so many lovely spots and great expanses of sand! Yes, it’s funny that so many people make it all the way to Cornwall but they don’t venture to Norfolk. Although that works rather well in our favour! I totally agree that getting away in the autumn can make for the best holidays. It looks like you had some wonderful weather and that cottage looks brilliant. I’ve heard great things about Holkham Hall but haven’t made it there yet. I think my kids would love the adventure playground. 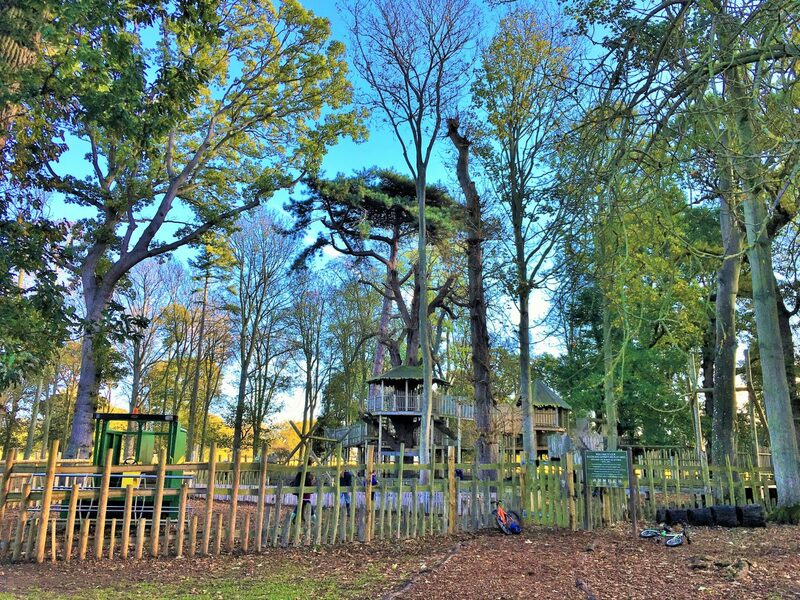 It looks more like BeWILDerwood than a standard play area! We were very lucky with the weather! I’m quite tempted to try an autumn / winter break in the west country now, so many lovely beaches to choose from! Norfolk is a part of the country we don’t know at all. It’s such a long way from Wales! My mum raves about it though and i’m tempted by a boating holiday on the Norfolk Broads, so hopefully one day soon. Thanks for linking up to #fearlessfamtrav this time around. The Broads are great fun, so tranquil and relaxing. But yes, such a long way from Wales! And you have such stunning beaches in Wales. Your photos are just stunning – you’ve captured such a beautiful light. What great weather you had for October! We’re actually looking to visit North Norfolk in a couple of months, so I’ll have to revisit this post. We were sooo lucky with that weather! The beaches there are stunning. Holkham beach is so vast that even in August you can find empty stretches. It’s utterly lovely. Book in advance if you’re going there in the school hols.